Today we on the road again. No rush only going 87.5 miles, besides Suzie wants to get a Chiropractic adjustment this morning. She called at 8 am and got a 9 am appointment perfect ! Back home by 9:30 and began packing up, of course while we are doing this a few nice neighbors stopped in to chat a bit and wish us safe travels. Everyone we have met here at Valley Vista is just wonderful. 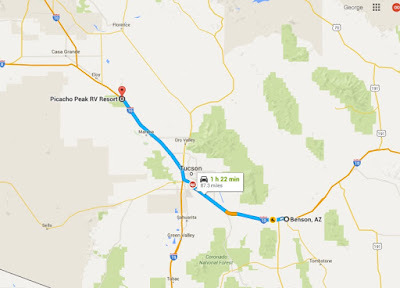 Finally hit the road about 10:30 onto I-10 west, to just west of Tucson going to Picacho Peak Resort . We have been here quite a few times since 2006 and made a lot of friends. Spent our first three Christmases here for a month 2006-7 and 8. And like to stop in for a couple nights just to say HI! It is pricey $35.00 a night that's why only 2 nights. Now here I made a big goof duh...! Took the proper exit under the interstate like I have done a 100 times before and turned left again right back onto I-10 eastbound ! Now I musta been day dreaming, or a brain fart. Part way up the ramp we have 2 choices, disconnect the car and back down the ramp or head back east 5 miles and try again. So back on I-10 and try again, this time guess I better keep a closer eye on where I am going. Second attempt was good. Checked in and choose a site across from Steve and Barb from Ontario, we have not seen for a couple years. He just had a Quadruple bypass in August and is doing wonderful so is Barb too. They have been fulltime longer than we have and still going strong. In their late 70's. We had a wonderful afternoon catching up with these guys, but then time to head on home and whip up supper. Set up our Weber Q, enjoyed a bit more sunshine, made a salad and fired up the grill. That was our wonderful day, just like we enjoy, moving on down the road, Meet up with friends and catching up. Thanks for stopping in again and hope you had a great day too. Check out the interactive map below to see where we have been this Fall and Winter..
Love the old cars I keep seeing in the area, and of course the sunny blue skies. Cold again last night but no problem, sunshine and blue skies all day here. Water hose was partly frozen this morning but as soon as the sun hit it all thawed out by 9 am. We always have water on out tank anyway so no big deal. Part of my early walkabout took me to Junction Express adjacent to the campground, Check out their chicken prices again we thinking of some Broasted Chicken again before we leave the area tomorrow. As I have said before only here and Anna Mae's in Ontario have we found it really, really good so we take it when we can get it. As I was about to leave spotted this 1949 Plymouth Convertible that pulled in caught my eye and just had to go check it out. Amazing all the great old cars we can see when here in the southwest. This one was still mostly original condition other than paint and a few other minor things. The original flathead six cylinder, interior looks pretty original too, column shifter so nice to see these every day drivers just being driven around town. And another walkabout spotted this bird just sitting in the trees staring me down for the longest time. Did take a quick pic but the flew away. Being our last day here Suzie sorts the laundry and I take it to let the machines do their magic and enjoy my e-reader in the process. Just over an hour 2 loads done and while I am doing this Suzie cleaned our house top to bottom, wow it looks like new again! After a bite for lunch, puttered around a bit, put our Weber Q away, checked tire pressure, emptied waste water, water hose away. Then enjoy some more reading in the warm afternoon sun, out of the cooling north wind. Easy supper tonight ordered our chicken for 5:20 picked it up just as it was finished cooking, yes it's fresh made. Comes with choice of salad, coleslaw our choice and I had made up a small tossed salad too. Now we are ready to move tomorrow. Hearing aide repaired, Thanksgiving taken care of and the holiday weekend should be over so now we gonna keep heading west a little bit at a time. The lower elevation and desert is calling our names. Thanks for stopping in again and hope you had a great sunday too. Labels: Arizona, Benson AZ, fall 2015, valley vista. Cold nights warm days. thats what we love about the southwest, but the hitch has set in, gotta move on down the road soon. Cool night below freezing again but that is normal for this time of year. Great sleeping weather though. Up early as usual waiting for the sunrise to get my first walkabout of the day. only 24 (-4c) this morning so a bit of frost on the car windows until the sun hits them. My early walkabouts take me around the campground until the sun comes up then the road back through the desert and around by the cemetery, guaranteed to be quiet there. We had sunshine and a wonderful day, temps in the mid 60's f very nice with the intense sun. Run about town for a few things, love the Ace hardware in here, one of the biggest I have ever been in and they are so helpful, talk about customer service, it's top notch! But we have the hitch itch, we have been in this area over 2 weeks now (mind you we love Benson) but gotta move, somewhere, anywhere is good. Got things done here, got my hearing aide back from repairs, some coach repairs done, Thanksgiving taken care of, so now we can move on down the road. Monday we outta here. Afternoon reading in the sun, then shade, then sun, then the wind comes and goes but the sun here all day. Love the afternoon reading for the 2 of us. About 3:30 I fired up our Weber to cook some pork ribs in a pan with sauerkraut for an hour or so then set on my grill mat and slathered on the BBQ sauce just to glaze then and then they are so amazing. If you like the recipe is HERE or my recipe blog top right sidebar. The grill mat keep the grill clean too. Still windy so my homemade windbreak keeps the grill up to heat and working wonderful, notice the blue, cloudless Arizona skies.
. Glad that you stopped by and really hope your day was as wonderful as ours. No Black friday crowds here in Benson AZ just wonderful sunshine. Today is gonna be wonderful sunny weather but a bit windy. As long as the sun is shining it will be amazing ! Check in with the office first thing and we here until Monday morning. This morning I need a few groceries and headed into to town. Hey its Black Friday, Thought I would check out the Walmart parking lot just for fun. Guess what not busy at all. So into the store and got my stuff. Amazing! No sales, no crowds nada... I guess it all happened last night at 6 pm. Glad we were not there. Home to putter around a bit and a light lunch. Heard a motorcycle fire up and went out to check out Harvies Gold Wing Trike,(from Ontario Canada) he took it out of his toy hauler and going for a tour today. Nice toy! same size engine as our Saturn car! I was in the mood to make some melt in your mouth shortbread cookies today. Got this recipe from Suzie's mom, so easy and so good. Not healthy but what is when it tastes so good? For the shortbread cookie recipe click HERE or my recipe blog on the top right sidebar. A really old Mennonite recipe that is sure to please. This time I added some colourful sprinkles just cause I could. Our neighbor Walter (made the Thanksgiving dinner yesterday) stopped by to give us a piece of the Sweet Potato and Apple pies he made for dessert yesterday that we did not get a chance to sample. And when my shortbreads were dozen took a 1/2 dozen over for them to enjoy. Now we can enjoy a sunny , but windy afternoon reading outside almost perfect except for the wind. The sunshine wonderful. Now time for supper, Weber Q ready to go, windscreen up and grill a tasty Salmon fillet to go with our salad. Super done and another pretty decent sunset to wind up our day. That was our Black friday, not busy and very sunny hope yours was a good one too. Gotta love the small towns! Happy Thanksgiving to all our American friends and we relocated today as well. And us lucky people who get to celebrate it twice once in Canada before we head south and again right here, wherever me might be. Today we are one the move, our cheap week at the SKP park is over and we moved exactly one mile up the road back to Valley Vista, much smaller and more our style CTC coast for us $14.00 a night. We don't want to travel on Thanksgiving so it's nice to sit here until Monday when we move on down the road a little further. We secured the coach pulled out at 9:15 am moved up the road and all set up by 10 am. They have a Thanksgiving Turkey dinner here at 1 pm. Cost is free (we like free) The park supplies the Turkey , mashed taters, dressing and gravy the rest is a pot luck we sign up for. We are taking the fresh Cranberry sauce with Orange zest that I made yesterday, you probably saw the recipe yesterday's posting. My Cranberries were gone in no time oh so good, I even put some orange pieces in this time, as Walter suggested ! 12:30 down to the clubhouse for a Thanksgiving dinner with 60 of our closest friends, (quite few have have not met yet) Just take our dish, plates and utensils and a nice bottle of wine to share. Right on time the feast began and the food so much nobody would leave hungry thats for sure and so many tasty dishes. Now this guy here Walter is a super fellow, he organized the meal and did the cooking, 3 large turkeys, garlic mashed potatoes, dressing , gravy and even baked some pies. Have been chatting with him since we first came here this year, helps that he does have a restaurant background too. Oh did I mention he did an awesome job! Now back to our site read outside in the warm afternoon sun. Then I made a quick trip to Walmart that was open today just to check it out. They are getting ready for their 6 pm sale today, All the aisles lined with pallets of items all shrink wrapped and labelled, areas closed off and the front of the store roped off for the people to line up. There is some amazing deals to be had Betcha it will be a zoo! But there is no way we will be there! Don't care how cheap the stuff is. Now back home enjoy the afternoon sunshine reading until the sunset then it's too cold to sit outside. No supper needed tonight after that excellent Thanksgiving meal glad it was at 1 pm, don't feel so full now, maybe pop up a bit of popcorn later and watch a movie. Hope y'all had a great Thanksgiving with family and or friends, we all have so much to be Thankful for. And thank you for stopping by again. Labels: Arizona, Benson AZ, thanksgiving, valley vista. 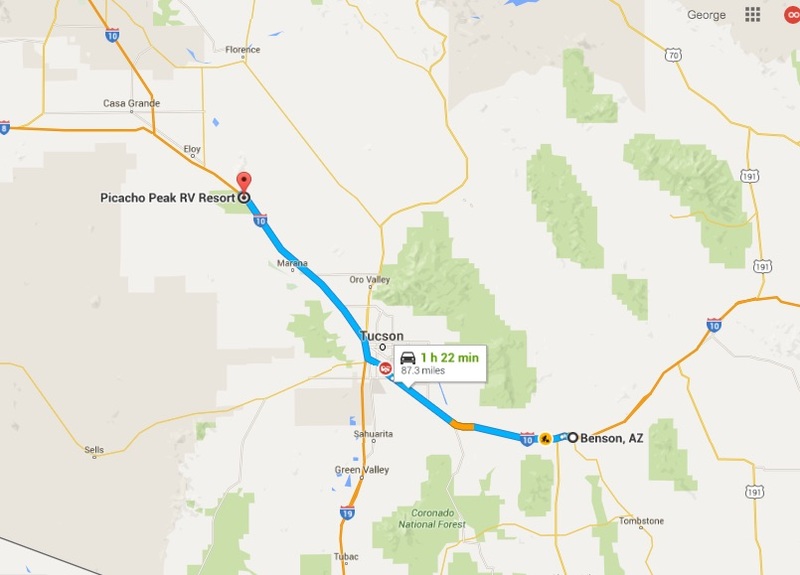 New Mexico to Benson Arizona, perfect travel day. Old Town Albuquerque and a bright sunny day. Near Albuquerque New Mexico for a week.